The three person crew of Shenzhou-9 – including the first Chinese woman to fly in space – have successfully conducted the first crewed docking for their country. Docking between their vehicle and the Tiangong-1 module – which has been on orbit since last year – was conducted at around 6:07am UTC on Monday morning. The approach and docking was very similar to the one seen during Shenzhou-8 last year, an unmanned event that was China’s debut attempt to join the handful of other nations that have the ability to rendezvous and dock vehicles in space. Shenzhou-8, was launched unmanned on October 31, 2011, via the Long March 2F (Chang Zheng-2F). The main objective of the mission was the docking with the unmanned space module Tiangong-1 that took place at 17:28 UTC on November 2. The new orbiting complex flew for almost 11 days, with the controllers performing various tests to the complex systems, before first separation occurred at 11:24 UTC on November 14. 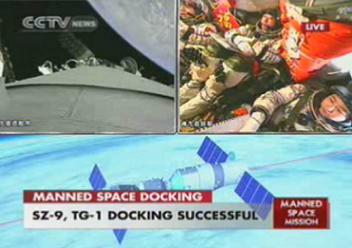 A second docking took place at 11:28 UTC. On November 16, at 10:30 UTC, the two vehicles separated for the final time and Shenzhou-8 begin its return to Earth, with landing taking place at 11:32 UTC. For Shenzhou-9 – which launched on Saturday via a Long March 2F/G (Chang Zheng-2F/G) – the opening phase of the final stage of rendezvous took place at a distance of 52 km from the TG-1 space module, allowing for SG-9 to approaching to within 20 km. In a similar scenario to the recent arrival of SpaceX’s Dragon to the International Space Station (ISS), several hold points – at 5 km, 400 meters and 140 meters – were required, allowing for a Go/No Go for continuing final approach, as numerous systems checks were conducted. During this key stage of the mission, Shenzhou-9 held the role as the “active vehicle”, while the Tiangong-1 was placed into the role of the “passive vehicle”. After soft docking, locks and bolts were secured between the two vehicles, lasting around 15 minutes. This was followed by the control center adjusting the cabin environment, such as temperature, pressure, in accordance with the conditions for crewed flight. 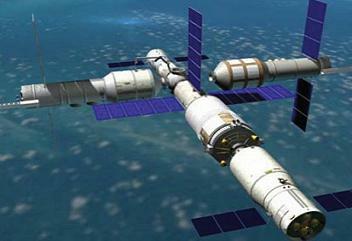 Crew ingress into Tiangong-1 was completed around three hours after docking. 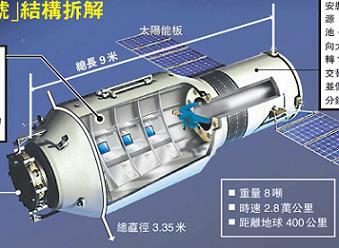 During the docked phase, two of the taikonauts will sleep in the module, while the third will sleep on the Shenzhou-9. Tiangong-1 is equipped with various systems and equipments for the crew, such as exercise equipment and a medical laboratory, in order to evaluate the astronaut’s health during their relatively long-term presence in space for the Chinese. The module also has waste recycling equipment, medical health monitoring equipment, male and female astronauts clothing, and fire extinguishers. 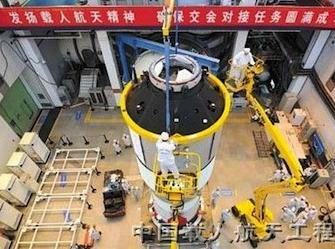 The TianGong-1 spacecraft is expected to stay in orbit for two years and rendezvous and dock with three different spaceships, the latter during the future Shenzhou-10 mission. The taikonauts will stay on board for a maximum of two weeks, a duration expected for the Shenzhou-10 mission. The 3.35 meter experimental module is composed of a enclosed front cone shaped section, cylindrical section and rear cone shaped section. On the front end of the experiment module are the docking mechanism and the measuring and communication equipment, which are used to support the rendezvous and docking with vehicles. The experimental module is where the taikonauts will live and work, with 15 cubic meters of space to move around in. This section is also equipped with two sleeping sections with adjustable lighting systems, exercise equipment, entertainment systems, visual communications devices and control systems. The 2.8 meter resource module will supply the power necessary for flight – containing two solar panels, propellent tanks, and other systems. In the future, the TianGong will be upgraded to a cargo vehicle to service the Mir-class station, with its core module due to launch in 2020. However, before that, China plans to launch the TG-2 TianGong-2 in 2014 (to develop the necessary technologies for water and oxygen regeneration necessary for short-term stay in orbit and to carry out some scientific experiments) and TG-3 TianGong-3 in 2015/2016. TG-3 will likely be equipped with two docking ports, allowing a permanent residency of the module. TG-3 mission will involve the development of the technologies necessary for medium to long-term orbital stays and to carry out more sophisticated scientific researches and experiments. At launch, Shenzhou-9 carried 300 kg of cargo on board, including water, food rations and experiments to be carried out during the mission. The Chinese – as would be expected – will be focusing on protecting the crew’s health. The measures are designed to combat the influence of the gravity-free environment of spaceflight and to ensure the taikonaut’s health remains as expected. While in orbit, medical examinations and protection measures will be conducted, including an on-orbit examination of the astronauts’ hearts, lungs and biochemistry conditions. Equipment, such as a bicycle ergometer, chest developer and neuromuscular electrical stimulation have been prepared on board Tiangong-1 to protect the astronauts against the effects of weightlessness and maintain their cardiac and muscular functions. 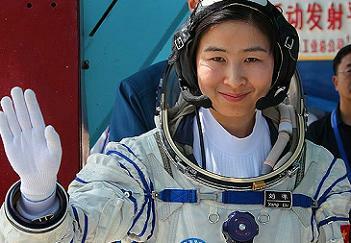 Liu Yang will receive a special focus on her medical examinations and exercises, given this is the first time a Chinese woman has been in space. The Chinese noted that they have three major mission goals for the crew, the first being the health monitoring of the taikonauts that mainly includes astronaut’s nutrition and metabolism, moods, and biorhythm changes in orbit. Secondly, the crew will make research on the physiological effects mechanism of weightlessness and the countermeasures, which include the impact study on the functions of astronaut’s cardiovascular, vestibule and brain in the orbiting flight. They will also study bone loss in space. Finally, the taikonauts will conduct research on environmental medicine and the astronaut’s operational capability in space.